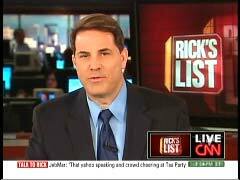 CNN’s Rick Sanchez failed to mention the party affiliation of former Baltimore Mayor Sheila Dixon on Friday’s Rick’s List program, but made every effort to identify former Congressman Tom Tancredo as a Republican. Sanchez ranked Tancredo higher on his “List You Don’t Want to Be On” for his remarks at the Tea Party Convention, despite Dixon’s conviction for illegally using donated gift cards for the needy. The CNN anchor gave the number three and number two spots on his “List You Don’t Want to Be On” just before the top of the 4 pm Eastern hour. Sanchez chose Dixon as his number three, and gave a brief on her resignation from office and how she received two years probation for her crime. He didn’t mention her Democratic Party affiliation during his brief, nor was it mentioned in the accompanying on-screen graphic. Sanchez picked Tancredo as his number two, and immediately identified him as Republican: “Spot number two: former Congressman Tom Tancredo, Republican, Colorado.” The accompanying chyron also explicitly mentioned the politician’s Republican Party affiliation. After playing a clip from Tancredo’s speech at the Tea Party Convention in Nashville, Sanchez went on to compare the former representative to a leader of the 1850s Know Nothing Party, and encourage his viewers to look up this historical figure: “Tancredo, American nativist, in the style of Bill Poole. Google Bill Poole, and you’ll see the comparison- especially Google him if you’re Irish.” William Poole was a member of the Bowery Boys, a street gang in New York City which supported the Know Nothings. One might conclude by these rankings that Sanchez thinks Tancredo committed the bigger offense by his remarks, compared to Dixon’s misuse of donated goods. Spot number two: former Congressman Tom Tancredo, Republican, Colorado- the Tea Party Convention is underway, and Tancredo was the opening act in Nashville. With one line, he demeaned immigrants, the presidency, and called many voting Americans stupid. Here it is. FORMER CONGRESSMAN TOM TANCREDO: People who could not even spell the word ‘vote,’ or say it in English (crowd cheers and applause), put a committed socialist ideologue in the White House. His name is Barack Hussein Obama.